HomeBlogMetatrader 4 Build 574 – Where are my indicator & EA files? \files – special “file sandbox”. MQL4 applications are allowed to execute file operations only within this directory. This also concerns Builds 577 (24 Jan 2014) through 600, plus all later updates such as 603, 604, etc. Once MT4 is automatically updated from build 509 to the newer version, all MQ4, MQH and EX4 files will be relocated to the appropriate folders listed above, but any user created sub-folders and files will need to moved by hand to the appropriate locations after the update is done. 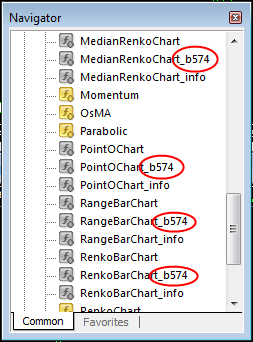 Otherwise your custom indicators and plug-ins such as Renko, Range and MedianRenko charting packages will not work. 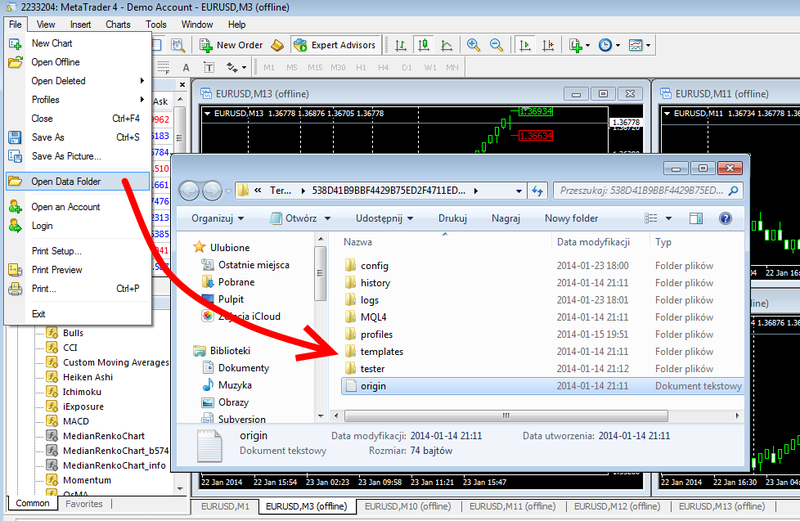 How to locate Metatrader’s data folder? The origin.txt file contains the path to your MT4 installation folder. You can view this file to verify that this folder is indeed the correct one for your MT4 installation. The presence of the origin.txt file in your data folder also indicates that MT4 is using an external data folder! Now that you know where your data folder is, you can begin copying the files that need to be placed in the new location (data folder’s MQL4 sub-folder). How to get RangeBars and other custom plug-ins working correctly with this MT4 build? 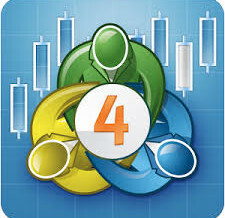 It is best to install the custom charting package with MT4 build 509, prior to the update to 574 and beyond. This way all the files will automatically get relocated once MT4 is updated (the release of the new build is scheduled by MetaQuotes for February 3rd 2014, but different brokers will probably provide the update sooner or some time after this date. ). It is also recommended to download the latest updates for Range Bars, Renko, Median Renko and PointO charts as the latest updates also include compilations for MT4 Build 574 and above. The plug-ins designed for the latest build (at the time of writing this post it is Build 577) can be easily identified by the _b574 suffix in the indicator’s file name. These will be placed in your <terminal_installation_folder>\MQL4 folder after you run the update scripts for individual plug-ins or if you download and install the latest custom charting plug-ins. Please note that these compilations will only work correctly with MT4 build 574 and above. They are not compatible with build 509 or below just as the files without the suffix are not compatible with builds 574 and higher. Indicators without the _b574 suffix are designed for use with MT4 builds up to 509 (20 Jun 2013). They are distributed for backward compatibility purposes only. Has anyone got this thing to work? After 3 hours, I’m still not getting anything. I was wanting to use the 7 day trial as I hear the Renko system is very good for day trading. Not much good if it doesn’t download to build 600 properly. The 600 has been out for a while now and I know of other indicator suppliers, all of which have a simple patch on their software to correctly install and run indicators without any fuss. The setup program takes care of all the nuances in the latest MT4 builds. Hi, few days ago i bought the median renko chart indicator. When i dropped the script CSV 2 fxt for backtesting on the eur/ usd 1 min chart a parameters list pops up and i pressed ok. Another message pops up saying ” Can’t open input file eur/usd csv.” Pls Note that my version is Built 765 not built574. You need to provide a tick data file in CSV format. You are also welcome to open a support ticket with our helpdesk, should you need more help with the backtesting process. My MT4 has many missing files. My MQL4 folder has only the indicator folder. I tried uninstall and reinstall several times but still have the same issue. Can anyone advise what is wrong with my computer settings? All new MT4 builds use a special data folder for storing EA, Scripts and Custom Indicator files. Please select “Open Data Folder” from the “File” menu in MT4 to access these files. They will be stored under the MQL4 directory.